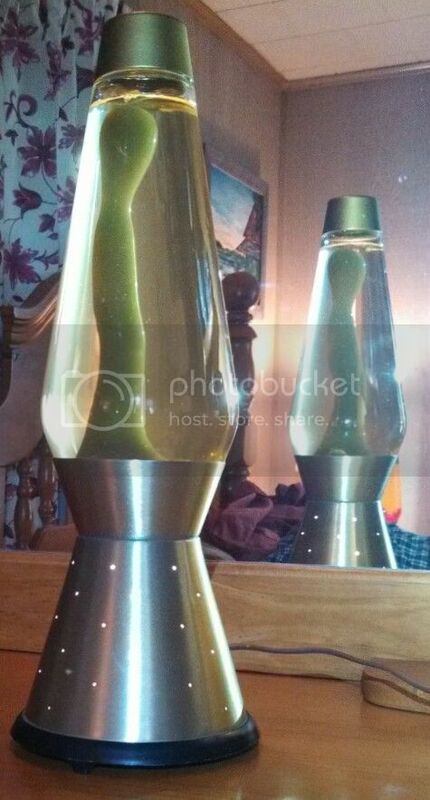 Old Green/Yellow Century Lava Lamp Rare? Since seeing the Mathmos astro newly available (in the UK only) in a bright & vivid green wax/yellow liquid variation, I started looking around for that color combo. Finding out that in the USA Lava Lite made that combo back in the older days for Century lamps and later in the 90's for the smaller 32 oz ones. I stumbled onto this lamp and immediately purchased it. 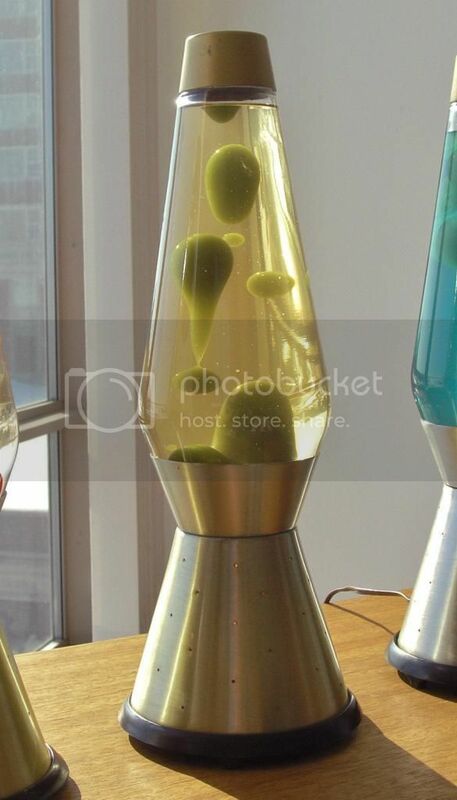 Quite jazzed as I'd never seen a picture of an old lava lamp in this color combo, only the color listing on sales ads, etc. I haven't been in this hobby long so there's a lot I haven't seen. I just wanted to know from more experienced collectors if this is indeed a rare color to find? And, what year would you say this lamp is? 60's? 70's? I will admit the shade of green & yellow are way different than I had imagined. 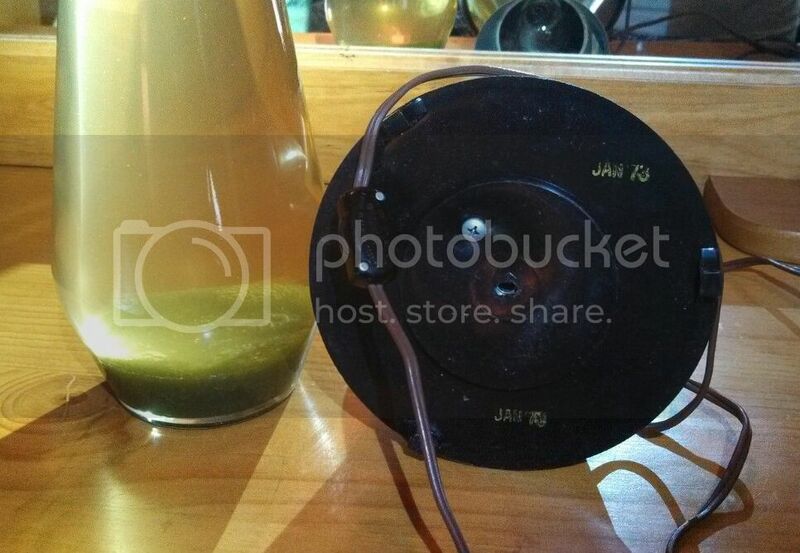 Almost pea soup & johnny cake (or urine?). Maybe a bit drab, but seems very kitschy and at-home in the era. Orange shag carpet, dark paneled walls... Looking forward to seeing this in-person! I remember seeing those four on eBay - neat lamps! Thanks for the info Erin, I will remember that! I came so close to buying that orange one. So, the mysterious lamp showed up in the mail last night! I was shocked by the condition, much cleaner overall than I was expecting. Even the cord is like new. I shined a flashlight and saw no under cap date stickers at all, just black. But the very bottom of the base (assuming it's original to the globe) is double stamped Jan 73 so not my b-day, but I like the year!! It uses less wax in the bottle than I've ever seen before. It also spikes & flows way differently than I've ever seen. A greater force of gravity against the wax for sure, even small blobs produce "rain". 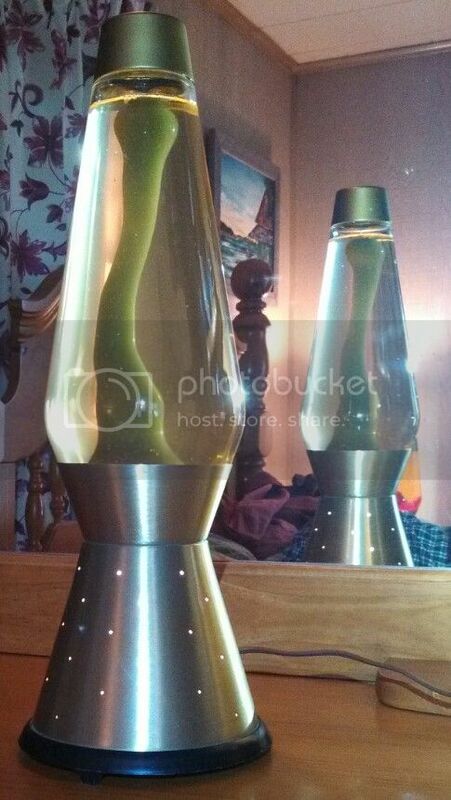 I think I'm in love with the vintage lava lamps now!! But I still have no way of telling if this is in fact a real green/yellow vintage lava lite. It sure looks like it is & it's high definition clear. But regardless, I want more vintage centurys now!! I must get a minty-in-box 70's red/yellow someday!! I wish I could help you on the other question. In my mind, that's a legit yellow/green, not a faded blue/green. But I'm not the expert. And, getting a mint red/yellow should be easy - they are very common and pop up on eBay all the time. Hmmm, weird. Yeah the wax level is definitely closer to #'s 1,3 & 5 in your picture when fully cold. Completely hidden when seated on the base. I just can't get over how awesome this looks when lit up. The star lites in the base have way more artistic merit than on the modern Heritage. I'll have to find an old 60's with 2-piece base along with a boxed 70's. Oh, and a Carlisle! If anyone has a Century globe that flows, but is bubbly, let me know. I'll happily buy it! So far, one of these pea-soup-green Centuries has showed up in a box. And that box was marked... Lava: Sage Green Liquid: Blue. I believe this 'sage green' was a color which followed the 60s true green and preceded the 70s cream color, and proved problematic. I could be wrong. I have also, on occasion, seen 32oz. and even Consort globes with this pea-soup-in-phlegm faded color, and always from the 1970-1973 period. The majority of icky-green Centuries seem to be '72s. Erin, I'll disagree that these are yellow/greens, but politely; I could easily be wrong. The early-70s Centuries, and only the Centuries, had the golden lacquer on the bases fade with age, leaving them silver. If you find a Century with a silver base and brass cap, that's why. Gunner, that line of Centuries, red/yellow, faded green, green/blue and orange/yellow, are exceptionally beautiful to me. I have a loosely-similar row, showing the three colors (red/clear, blue/green, and an early true-orange yellow/orange) and the three vintage bases (brass, brass-faded-to-silver, and two-piece matte copper). Dr. WHAT? !, "Champagne Mist" used cream-colored wax. The liquid was a pale amber, and was hazy like the early Enchantresses. These are mucho rare, and the liquid in all the 'mist' models seems to have turned un-hazy with time. do you have a way to fix the problem? i have one but want to fix it, not sell it! no amount of running or heating seems to do a thing to the bubbles in the globe. flow is great though. I would always go with Jonas' assessment - he's much more knowledgeable than me! 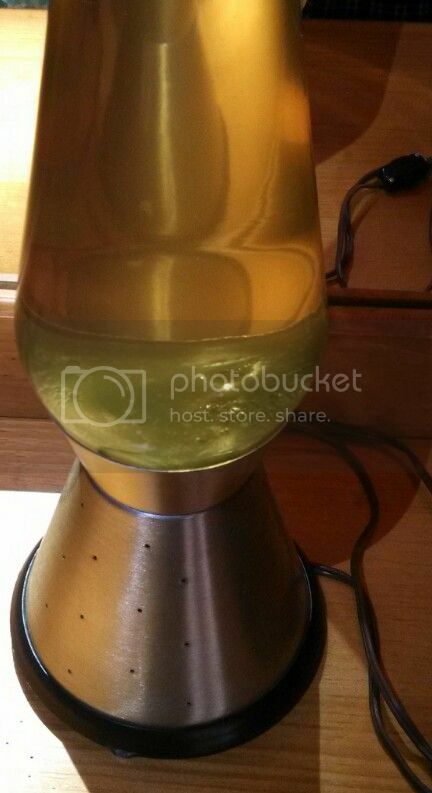 But, what do you make of the yellow/green lamp I have (posted in this thread)? I've never seen that listed anywhere and I've seen a few of them over the years. That one, Erin, is indeed the rare 104, yellow/bluegreen. Also, side note, all of the early amazing-flow lava I have seen is always filled with little bubbles, I don't mind it but was this not how they originally appeared? Thanks gang! You sir have an amazing lamp!!! Congrats on restoring the flow! VintageK, the Enchantress 'mist' colors were, for the brass bases: lime/green mist; yellow/orange mist; blue/blue mist; red/green mist. For the flocked bases: Malibu Orange flock, yellow/orange mist; Mojave Gold flock, orange/yellow mist; Mexicali Avocado flock, lime/green mist. Like the brass ones, these (which came slightly later) offered both planter and plain models. Later on, I've seen a brass model in blue/green mist, which had very vivid blue and green colors. If I had to guess, and that's all it is, I'd say yours was a lime/green mist using the early-70s "sage green" lava. From what I've seen, the mist liquid tends to either turn clear, or get much more cloudy. When new, I believe the liquid was only slightly hazy, but probably picked up the light and formed a solid-looking colored background to the lava.